This asymmetrical speed fin is made for winning new speed records. The asymmetrical profile was developed in multiple CFD analysis for low drag AND an excellent stalling/spinout robustness. This gives the rider a lot of confidence to push hard during the speed run. The thin profile requires special measures for making the fin durable and robust. Therefore the fin is exclusively made of the high-end carbon types IMS65 and TeXtreme. These materials have a very high safety margin before breaking and are the basis for long-term performance. We produce in length and rake based on the requirements given by customer. The specified carbon-layup creates a very high bending and torsional stiffness. 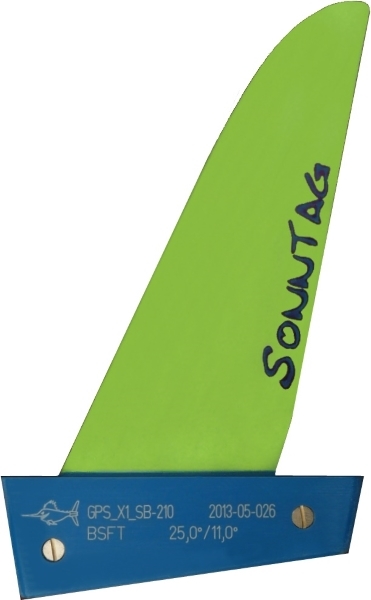 Only available for the starboard side (right foot front during the speed run) in length of 17 to 23cm in Tuttle.